University of Alabama coach Nick Saban is one of the most successful coaches in the history of college football. He won the national championship in 2003 as head coach of LSU. He has won five national championships at Alabama over the last nine years. To achieve those levels of success, Saban clearly must find ways to motivate his teams and players. In his book, How Good Do You Want To Be? A Champion’s Tips on How to Lead and Succeed at Work and in Life, Saban explains one method of motivating his players that works – and one that doesn’t. To whom would you give your game ball? One season at LSU, Saban’s team approached the end of the season with two important games remaining. Before practice in the week leading up to the first of those big games, the coach asked his players to write down on notecards who they would give their game ball to if they played well in those last two games. Normally, Saban doesn’t give game balls unless a player does something truly special, so most of those players had never considered what they would do if they received one. On the cards, players wrote down people special to them in some way. A parent. A grandparent. A teacher. A counselor. A coach. A child. By asking the players to write down to whom they would give the game ball, Saban helped the players find their “why,” their own personal motivation that would push them to give their best in those final two contests. Saban also describes two games his team lost because he used the wrong type of motivation – fear. Before LSU played a good Ole Miss team, Saban noticed his players going through the motions in practice. He didn’t feel they were as focused as they should have been. The players weren’t showing the effort he felt they needed. In an attempt to light a fire under them, Saban started talking about how good Ole Miss was. He harped on all the things that Ole Miss did well and why his players would have to be at their absolute best to defeat their opponent. Saban’s use of fear as a motivator didn’t work. They lost. Two years later, after lackluster practices leading up to a game against Florida, Saban resorted to the same tactic, and his team lost again. 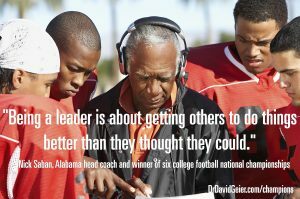 After both of those games, some of the senior leaders approached to tell him they liked it better when the coach motivated them by getting them to believe in themselves and not building up the other team. Using fear as a motivator might seem like it could boost your team’s performance, but it can actually have the opposite effect. It could make your players and your employees anxious about their performance. They might focus on the outcome and the possibility of losing and not on trying to do their best on every play or in every encounter at work. They will act to avoid mistakes rather than taking steps to be their best. A team must work together. Every player on a sports team, and every employee of the company must do their job to elevate the performance of the organization. How can you get everyone on the same page and fighting for the team? Well it would seem that a rousing speech like we see in sports movies would do it, but it isn’t necessary. As Saban shows, you simply need to help your players and colleagues motivate themselves. Find your why, and encourage everyone in your organization to find his or her why. For one person, it might be to help her kids go to college. For another, it might be the pride of doing his work with excellence. One might be working to make the pros in that sport or move onto a bigger company. If everyone taps into their own personal why, their best efforts could propel the team forward. Your job as leader then is to help your team channel those motivations into efforts that benefit the organization. You can show how focusing their best effort can not only help them achieve their personal goals but also help the team win. Whatever your role, whether you are the CEO, division manager, or a member of the sales team, what will you do to inspire and motivate your team and coworkers? Episode 368: How does when we eat affect our health? Should we blame top college football players for skipping bowl games?